This is a review of Fusion Health’s Hair Tonic supplement. Fusion Health claims that their Hair Tonic supplement provides the vitamins and minerals necessary return your hair’s natural elasticity.They also claim that it can fight the early loss of hair color, as well as promote new hair growth on areas affected by aging. Continue this article to find out more about this dietary supplement & find out if it is the right product for your needs. Per the instructions provided by Fusion Health, it is suggested that individuals take two capsules daily, with food. Individuals between the ages of 6 and 12 years of age are encouraged to take between one and two capsules daily, based on their personal health. This product is not recommended for any individuals under the age of 6. Based on the information provided by Health Fusion’s web site, it is unclear whether or not their Hair Tonic supplement contains high enough levels of their so-called “active” ingredients to have a noticeable impact on the human body, as they are (as of yet) untested, and therefore have no established “standard” levels. We can, however, verify that these ingredients are included at high enough levels to be seen inside the human body, if observed. Fusion Health states that no side effects or drug interactions are known to exist. However, there always exists the possibility for specific nutrients to interact with medications, and because of this, individuals should always keep their health as their first priority when selecting a dietary supplement. One bottle of Fusion Health’s Hair Tonic supplement costs $26.95, and contains 30 pills, which is enough for 0.5 to 1 month’s supply. No subscription programs could be found for the product, nor could any coupons or discounts (either on single or bulk orders) could be found on Fusion health’s web site. 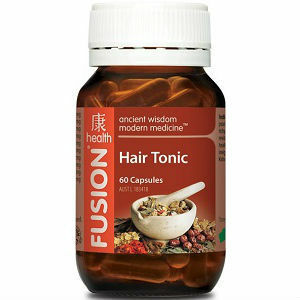 Fusion Health doesn’t offer any sort of guarantee on their Hair Tonic Supplement, save for a standard return policy, which is 7 days from the time of arrival. Items must be returned unopened and unused. Items cannot be returned for a “change of heart”, and will not be honored. Many testimonials could be found on the company’s web site, all of which were overwhelmingly positive (and somewhat long-winded) success stories, which makes us somewhat doubtful of Fusion Health’s claims. Fusion Health’s Hair Tonic supplement seems to be a well-made product, albeit one with an uncertain future. Their supplement contains several ingredients that, if proven effective, could have a great impact on natural hair loss. Also comforting are the several testimonials available on the company’s web site. Unfortunately, Fusion Health’s ingredients included in their Hair Tonic supplement lack any peer-reviewed, scientific studies to back up their claims. Also of note are the amounts contained within a single bottle of the product, which is only enough for a half-month’s supply, effectively doubling the cost of the product. John Brownstone	reviewed Fusion Health Hair Tonic	on June 30th	 and gave it a rating of 2.5.